Many thanks to poet and birth doula V. Wetlaufer for penning this guest post on poetry & public libraries! V. is a Lambda Literary Fellow, the author of two chapbooks — Scent of Shatter and Bad Wife Spankings — and her poetry has appeared in Drunken Boat, Word Riot and Bloom. She also blogs regularly at The V-Spot. I owe my start in poetry writing to my undergraduate college’s library. Crossett Library is small, but what they lack in numbers they make up for in the quality of their collection. I was in my regular library carrel, where I went to complete all my schoolwork senior year, writing a paper for a literature class, when I decided I needed a break. Off to the shelves I went to find a collection of poetry. I randomly selected a collection of Adrienne Rich’s poetry and opened the volume at random. So moved by her work was I that, having never written a poem before, I scribbled my very first poem inspired by a book plucked at random from the shelves. I’m fortunate enough these days to live in a city with a fantastic public library, Salt Lake City, as well as a truly incredible university library I rely on for my PhD program. However, I am always saddened when I turn to a library to feed my poetry needs and the poetry collection is sadly lacking. I am especially sad when there is a dearth of contemporary poetry. I am a huge fan of poetry from Chaucer to Wordsworth, Whitman and Eliot and everyone in between, but I believe that the best way for the majority of people to encounter poetry for the first time is through contemporary work. It’s no secret that poetry is not very popular these days. Aside from Billy Collins, Mary Oliver and the poet laureates, not much poetry gets sold or read by non-poets, nor does it circulate widely in library systems. However, there are many ways libraries can feature poetry, through children and young adult-targeted displays, or during National Poetry Month (April) or even on special occasions. So much of contemporary poetry is funny, heartwarming and fascinating, but patrons often don’t know where to begin. Even as a poet who pays attention to new releases, there is so much new work appearing that it’s difficult to keep up. I often choose which books to read based on reviews I read or displays of new titles in my university library. This title would easily appeal to the genre-lovers among us, and the cover (by which we are told not to judge the book, but let’s be honest…) is eye-catching with its collection of dyed hair, pierced and tattooed cast staring out at the viewer is hard to ignore. 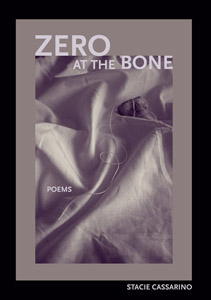 Another book for the romance lover is Zero at the Bone by Stacie Cassarino. This is my favorite book of 2010. Winner of the Lambda Literary Award for lesbian poetry, Cassarino’s book offers stunning descriptions of love and heartbreak. (I actually reviewed this book on my blog). Cassarino’s poems are startlingly beautiful and surprising in their lyrical vivacity, yet they do not alienate the reader unaccustomed to poetry. The poems go deep, but speak of identity, love and betrayal in ways that everyone can understand. 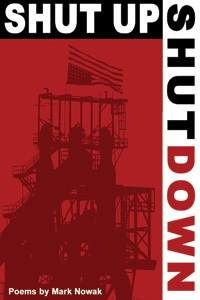 Finally, I will suggest a fabulous book by Mark Nowak, Shut Up Shut Down. Nowak is best known for his work with labor unions and coal mines. In this book, he samples and arranges different kinds of texts (oral history, journalism, etymology and grammar) from a class-conscious perspective; the result is a provocative narrative of disenfranchisement. The five serial poems are a mix of prose, short compressed lyrics and photos; their artfulness is often located in the spaces between and combinations of different registers. The plainspoken language and thoughtful approach to stories of workers laid off, the repercussions of coal mines and the everyday of the blue collar worker will appeal to lots of people. I was fortunate enough to meet Nowak during a conference on documentary poetics at the University of Utah last year. I think these three books offer a portrait of the contemporary poetry landscape that shows poetry may not be what you think it is. You can find poetry for pretty much any taste, and whether or not patrons come looking for poetry, it is rewarding to be able to offer them a discovery of what gems lie in those dusty 811 shelves. For other ideas check out past winners of the Lambda Literary Awards, Poet’s & Writers magazine for recent contest winners (most first books of poetry are published through contests) and review magazines like Poets’ Quarterly or Rain Taxi.